Its finally finished and in her crib! It may be about 7 months late, but I got it done before her first birthday which is when Cupcake got hers. I meant to get this posted a while a few weeks ago but between binge reading, a new season of House of Cards, chores, and finishing up a new pattern, I have been really slow on the whole get things written about front. Better late than never! I found the line called Good Nature by Riley Blake and fell in love. 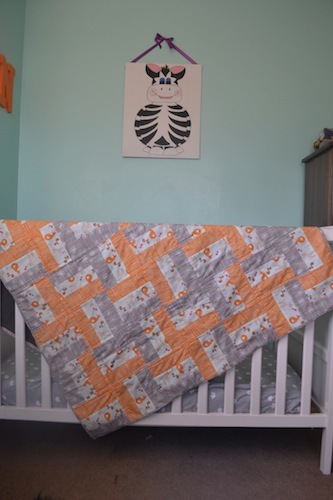 It was perfect for Blueberry especially with her nursery color theme being grey and orange. It might seem like an odd color combo for a baby girl but my girls are sharing a nursery and Cupcake’s color was purple and jungle animals. 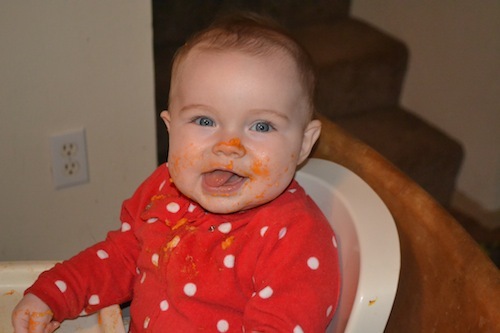 Around 8 months old her preference for everything orange began. So we decided to stick with the theme that was slowly taking over our house. Even my running shoes have joined in. I decided to go with simple grey micro-fleece for the back. 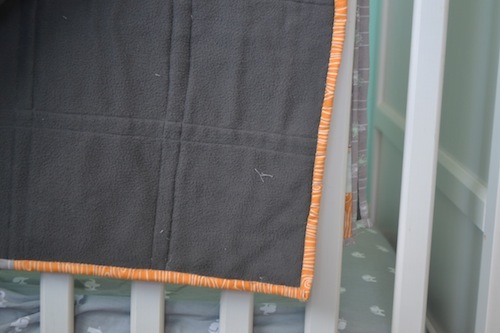 I really like doing fleece for the back of kids blankets, it just makes them extra soft and warm. 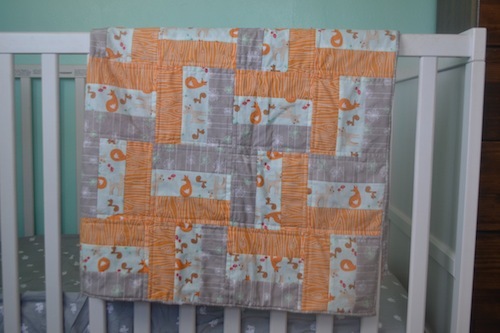 Despite my lack luster abilities at quilting (i stick with the simple straight lines and patterns) the fleece doesn’t make it any more difficult than your basic quilting cotton in the back would. On a baby note, Blueberry is doing fantastic. She has recently learned how to crawl going forwards. Is the happiest baby, has two front teeth to show off now, and really enjoys eating! She giggles a lot at her big sister and our two dogs. Those two girls are going to be quite the team (I am going to be busy) but already are such good buddies.